For painting miniatures or other items that require extremely precise detail, use these ultra mini set with short, comfort grip handles. This 12 piece set is designed for extremely precise work such as miniatures. Each brush has a shorter length Comfort Grip(r) handle to help you paint small details in comfort. It contains liner, angular, fan, pointed round, filbert and grass comb brushes, amongst others. The white handles have a thicker grip to help precision. 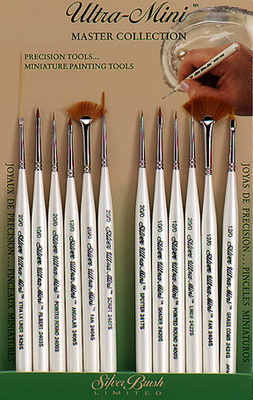 The bristles are golden taklon, a quality synthetic fiber that is dyed and baked to carry more liquid and withstands acrylic paint better than natural bristle. Taklon also offers superior control for extremely small work spaces, especially when combined with a narrow head. This set will give you an advantage in detail painting - use it for miniatures, dollhouses, etc. It contains all of the brushes you need for any detail project.